“I really enjoy work that I find difficult to understand or engage or place historically,” says art dealer Rowley Kennerk. He is drawn toward ambiguous art, but Kennerk has no uncertainty about his role as a young gallerist. His eponymous gallery is “first and foremost a business.” Of course, he means that “in the good sense of the word business,” in that many artists find it awkward or complicated to court collectors and viewers, which is where Kennerk comes into play. He seems to have the natural charm, agility, and motivation necessary to act as both the meeting ground between artists and buyers, and as a progressive voice for his generation. In the business of the art world, building strong relationships is just as important as having a smart eye for smart art. Kennerk’s gallery is currently passing its six-month mark in existence. As the new kid on the block of Peoria Street, Chicago’s real-estate ground-zero for contemporary art galleries, Kennerk must contend with such legends and heavyweights as Rhona Hoffman gallery and Donald Young gallery. While Hoffman is celebrating her thirtieth year in Chicago, the legacy of the work that she has supported continues to succeed beyond bounds. In fact, Conceptual art is flourishing, tagged with the prefix Neo, and is being carried into this century by newcomers such as Kennerk. Currently at Rhona Hoffman, a geometric sculpture by Conceptual art pioneer Sol LeWitt represents the staying power of idea-based art, and as it is composed of building blocks stacked in a gentle upward thrust (reminiscent of the Sears Tower), reminds us that chronic lust for ‘the new’ often succeeds by pushing off from the shoulders of the giantess. Kennerk does not own LeWitt’s sculpture, but what LeWitt codified exceeds the structure of formal or expressive art; it is a prescription for a moral life. Or, in LeWitt’s words, “Ideas can be works of art.” Idea art does not become dated in the way that Op art or even Pop art from the same period yellows; Conceptualism is the product of an international cosmopolitanism. Architectonically, Rowley Kennerk’s programming is turning out to be like this sculpture, or perhaps like a Mies van der Rohe building: it is both assertive and supportive of the new canon of art. If both art and life can be stylized, then Kennerk is International Modernism, which was (and continues to be) such a powerful code for living because it could exist anywhere in the world without appearing out of context, untranslated from one locale to the next. In much the same way, Kennerk supports art that can be carried around the world in the global art market without suffering from jet lag. Currently the gallery is exhibiting a film in a two-part installation by German artist David Lieske. Lieske’s film draws references from the Italian filmmaker Pier Paolo Pasolini, the lighting designers Howard Harrison and Ingo Maurer, and rocker Patti Smith. While the references are varied, the connections between these subjects, once grasped, are illuminating, so to speak. In fact, Lieske is here most interested in exploring the relationships between physical light (such as from a bulb) and representations of illumination. As Lieske’s film progressed, it slowly turned into pure white light, thus illuminating the darkened gallery and revealing several hidden silkscreen prints of light fixtures by Maurer. This month, in the second part of the exhibit, the film has been re-installed on a pedestal, cased within its 16mm metal container, propped against plexiglass, and displayed alongside two photographs. The relationship between the various objects and the reflections within the plexi and the glass covering the photographs is perhaps more of the artwork than the actual “alternate installation” of the film. Again, this highlights Kennerk’s tendency for supporting artists who have a total vision of cosmopolitanism. Idea-junkies and culture-aficionados would be hard pressed to dislike such art. 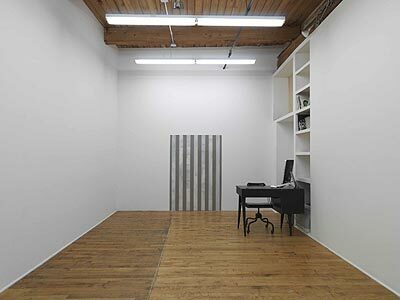 Neo-Conceptualism, drawing from Sol LeWitt’s design, and which grew exponentially in Chicago in the 1980s and 90s with such artists as Jeanne Dunning, Gary Justis, and Richard Rezac, is not Chicago-bound; it connects a network of worldwide intellectual practices. Similarly, Rowley Kennerk, who was born, raised, and educated in the Midwest (from Indiana to Michigan to Chicago), is working independently of the hardnosed Chicago style. Instead, he seeks to bring new ideas and artists to Chicago viewers. Some art in the gallery’s short exhibit history directly references 1960s culture and the breakdown of absolutism, such as works by Richard Prince and Sam Durant. Others, such as David Liekse and Florian Morlat’s works (who Kennerk will show later this year) press on the barriers of history in favor of an openness to the universal. By introducing the work of these “significant emerging” artists to Chicago audiences, Kennerk hopes that we will be as challenged as he is, and that our taste for uncertainty, as well as the uncertain future, will be edified.